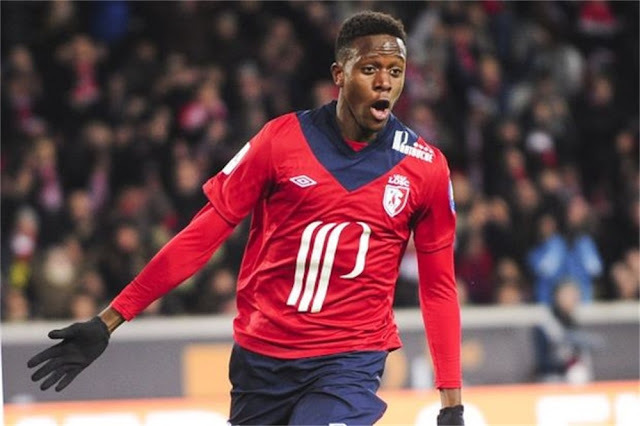 Season 1 had seen Origi make a good start to his journey, but he needed to do even better in his second season if he wanted to stay on track for the challenge. 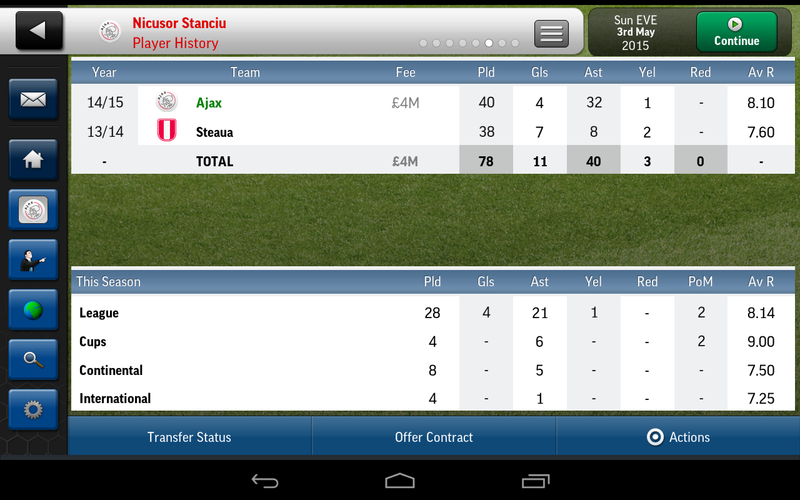 I decided that another assist machine was needed and my key signing for the season was Nicusor Stanciu: a bargain at £4 million. I also brought in Tomas Rincon to firm up the midfield. There were others, including a familiar looking, young Welsh midfielder with an eye for the ladies, but I struggle to recall the details. 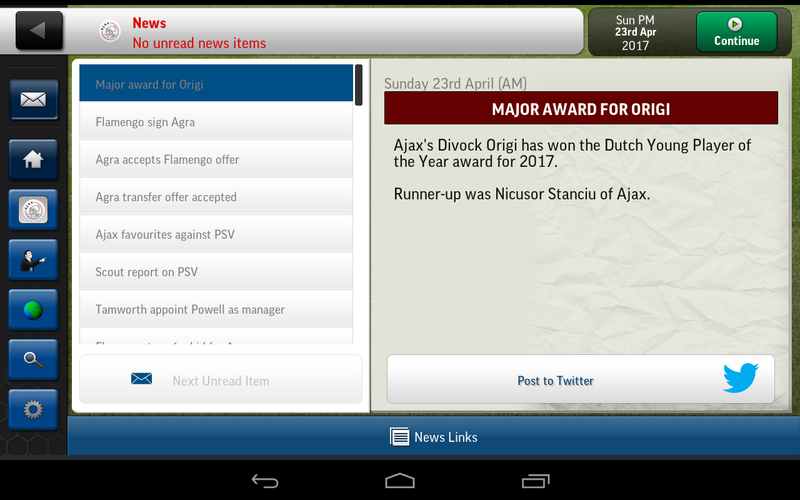 I know I won the Dutch Super Cup, but I can't seem to track down a picture. 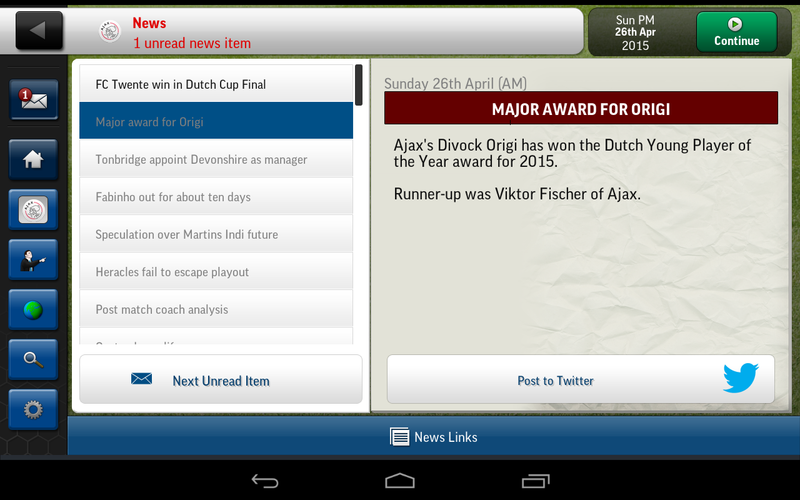 Yet again I endured a penalty nightmare in the Dutch Cup, but this time I didn't make it as far as the final. Not as dominant as last year, but a win is a win. 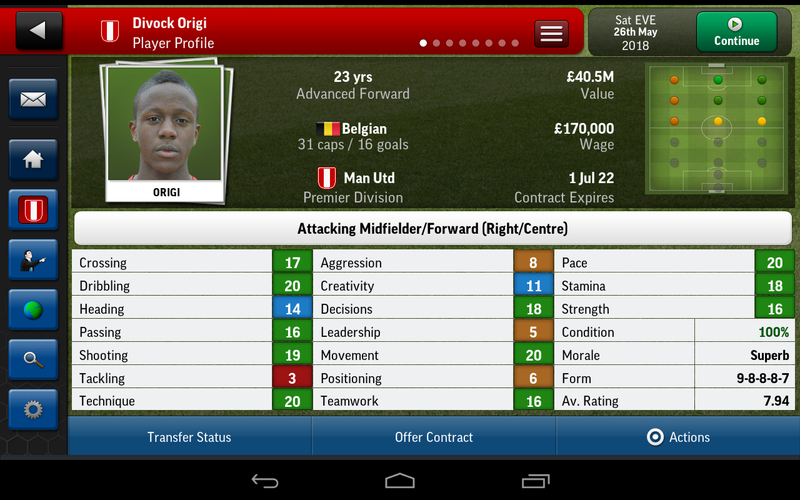 A great second season from Origi, helped a bit by the six goals on the last day. Slightly disappointing from a club perspective, but not too bad. The problem with managing in the Netherlands is that the top clubs can't keep their greedy little hands off your players. 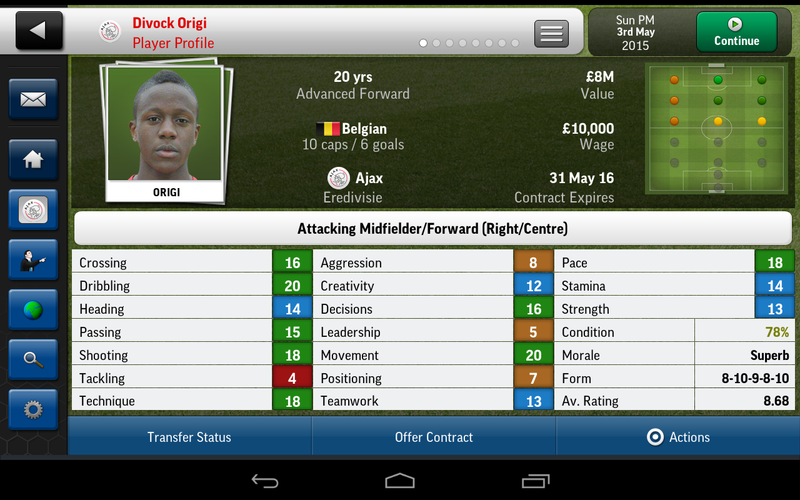 No bids for Origi yet, but I fear that it's only a matter of time. I've no idea how he'll react if I start rejecting offers from big clubs, but if he starts getting itchy feet I'll have to start thinking about a change of job. I'll need to get my rep up so that I have a decent chance of landing a job at the sort of club that could keep Divock happy. As always, I'll be grateful for any comments. 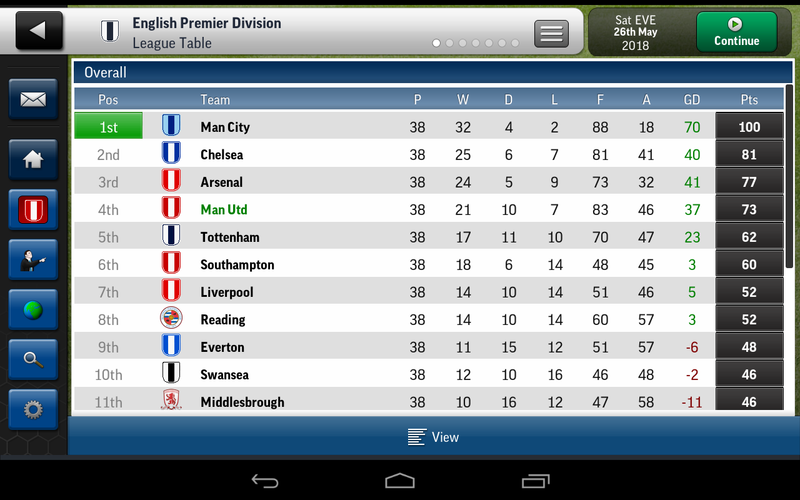 That was my 4-1-1-3-1, which seems to work quite well in an easy league, but results like that are sadly quite rare. Origi had a great second season, but that only put pressure on him to top it in his third. 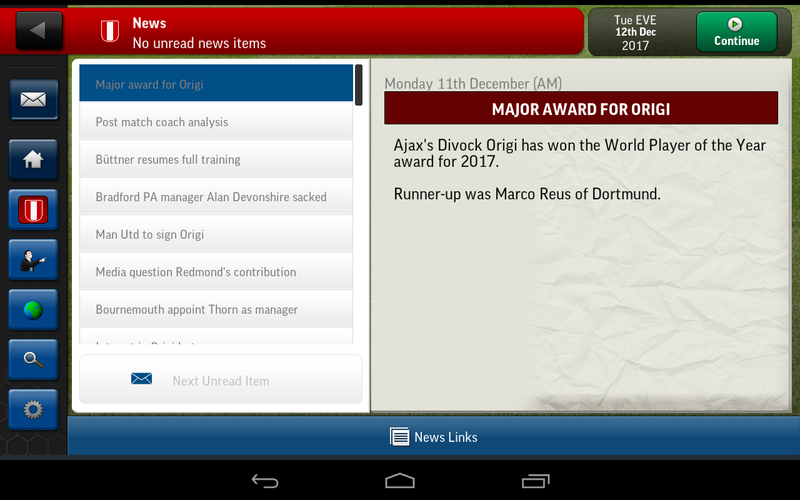 Origi snatches victory in the last minute of the game. More disappointment in the Duth Cup. I'll win it one day. 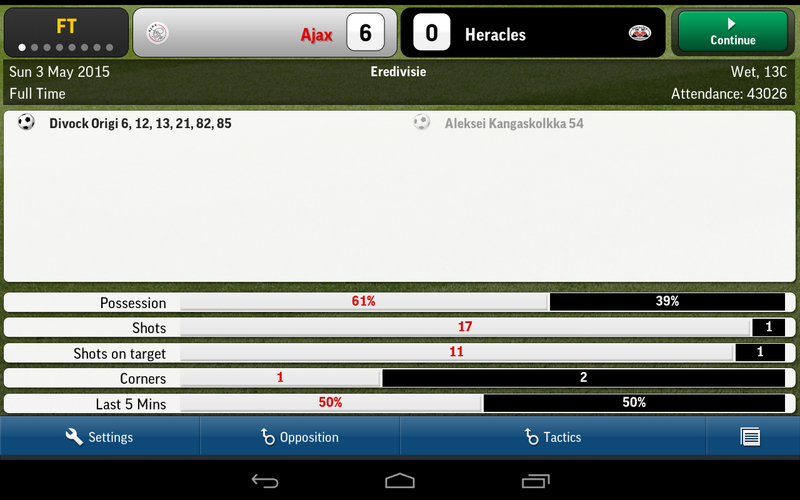 I got further than ever before in the Champions League, but once again Juventus crush my dreams. I seem to have forgotten to take a picture of his stats. They'd improved a bit, but looked pretty similar to last season. Still only national reputation. I'm insulted. Origi didn't do quite as well as last season, but a very decent performance, nonetheless. I got my first bid for Origi at the end of the season and he wasn't too happy when I rejected it. I think we're friends again now, but I fear this is a sign of things to come. I need to start looking for a new home for the two of us: somewhere with lots of money. Please leave your comments: they make me feel warm and fuzzy. Thanks. Fingers crossed I can find something suitable before he gets restless. Indeed. I think there are already relatively few clubs that could be relied on to have enough money to buy Origi, so let's hope that one of those ditches their manager soon. Of course, I'm not sure I have the reputation to get a job at a really big club yet, so I'd better start winning a bit more at club level. The third season was good, but there was still room for improvement. Most of my transfer activity was pretty unremarkable: a handful of promising youngsters that seemd to have appeared out of nowhere, but I did make one big signing. 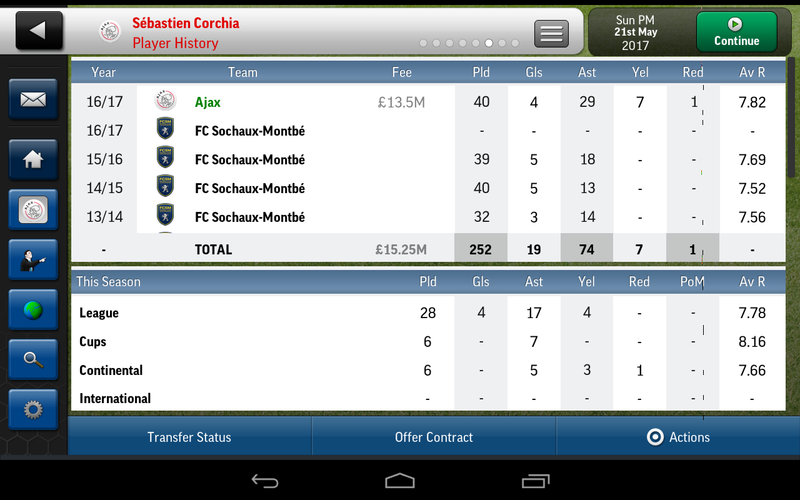 Pacey French wingback Sebastien Corchia joined Ajax from FC Sochaux-Montbe for the princely sum of £13.5 million. It was money well spent. 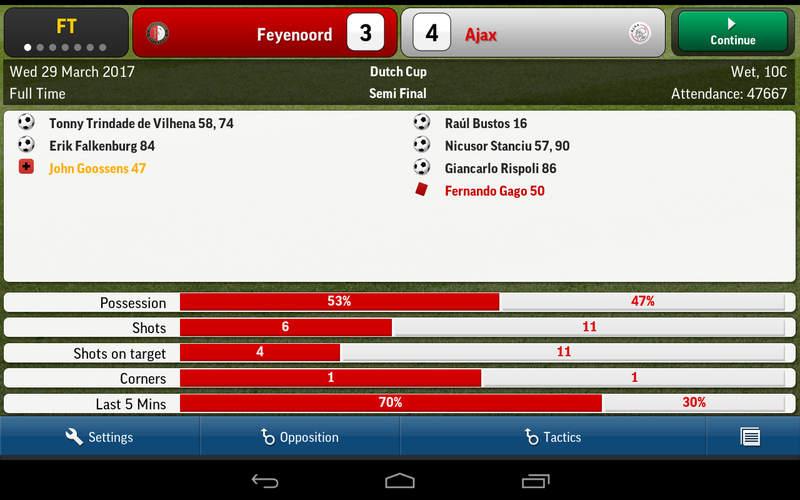 The standard Dutch Super Cup victory, complete with obligatory goal from Origi. Observe the timing of the goals. That was a stressful match. At last the pretty is mine. Mine! Disaster in the Champion's League. King of the world at just 21. 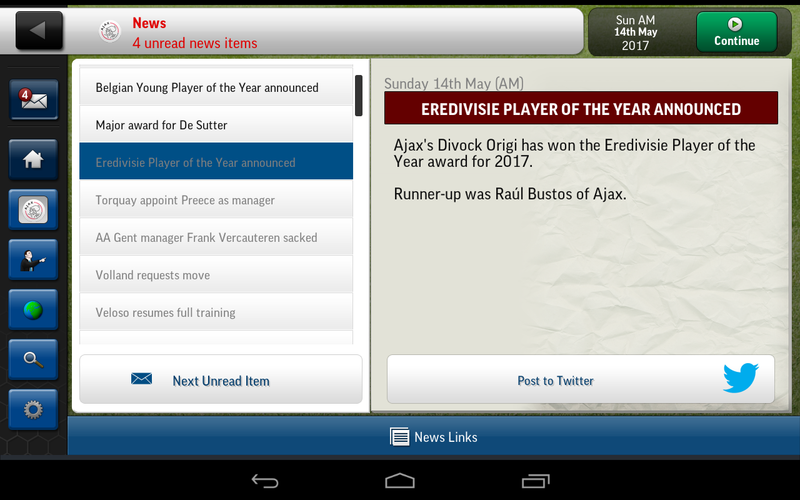 The Ajax youngsters clean up at the awards. A nice pick up in form for Origi and, Champion's League aside, a good season all round. 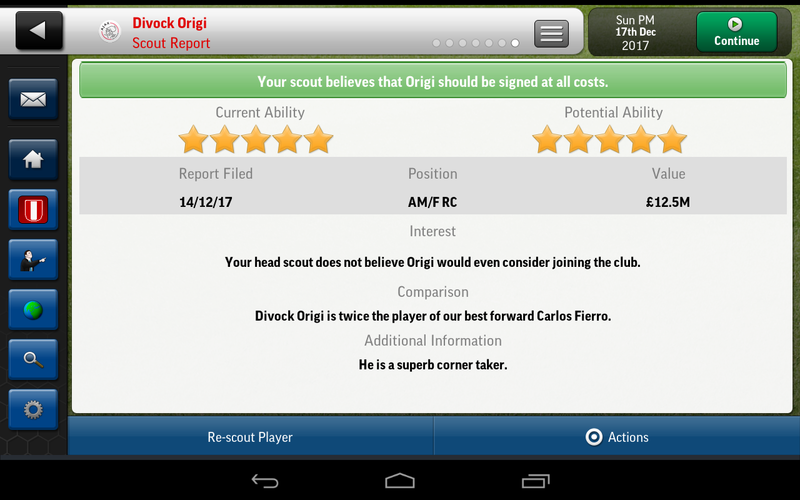 I'm glad my reputation has gone up a bit, since I had yet another offer for Origi in the summer following this season. He didn't kick up a fuss when I rejected it this time, but I can't rely on his loyalty forever. All feedback and comments will be gratefully received. Swear i commented on this , either way mate fantastic going . 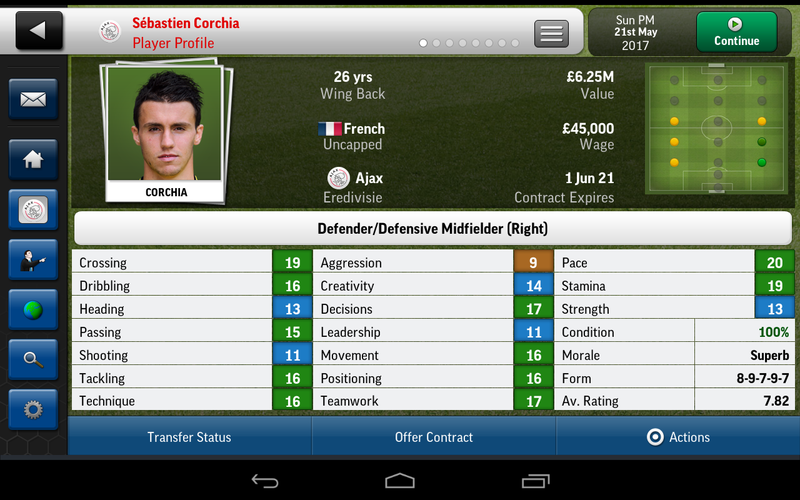 Good results from a youngster. Personally I'd offer him 5 year contracts every year until he demands more than you can pay. Even if he does kick up a fuss about rejecting offers, I reckon he's score more unhappy I'm holland than he would if he was elsewhere and happy. 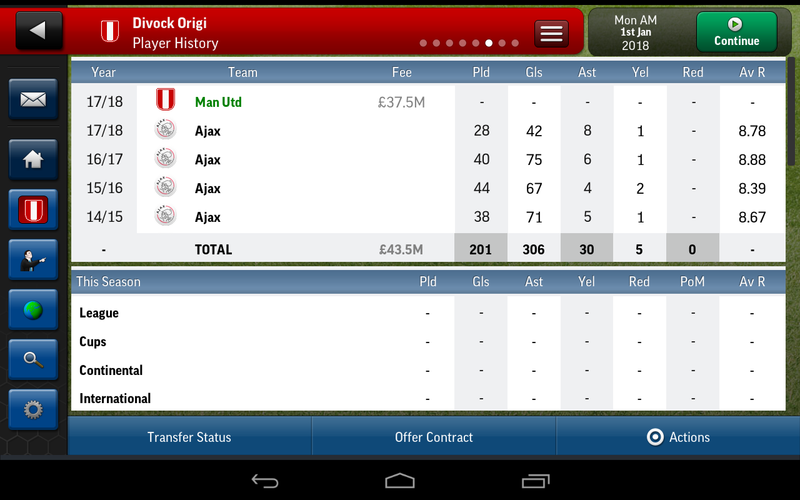 And if he finally rejects new offers but still has 4 years left while he's in his prime, he'll still tear holland up. Thanks for all the comments. 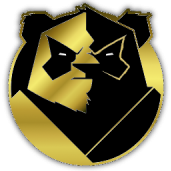 I hope to have another update for you this evening. I've used a couple of tactics so far, one for the first and fourth and another for the second and third. I'll add them to the update, but to be honest I'm not particularly happy with them. They do quite well against the weak opposition in the Dutch league, but don't fair so well against decent teams. Season 1 and 4 - my 4-2-1-3 - the most successful version had a DLM and an MC in midfield, but was otherwise the same as in 2013. The 4-1-1-3-1 was more reliable in general, but wasn't quite as free-scoring in the league. The 4-2-1-3 scored loads in the league, but didn't do so well against decent sides. Season five required an altogether different tactic, but I'll cover that when the time comes. From my experience, using a AMC (specially as a AdP) costs some goals from the striker. If you have and AdP in the midfield he'll run up a lot. Same with B2B. 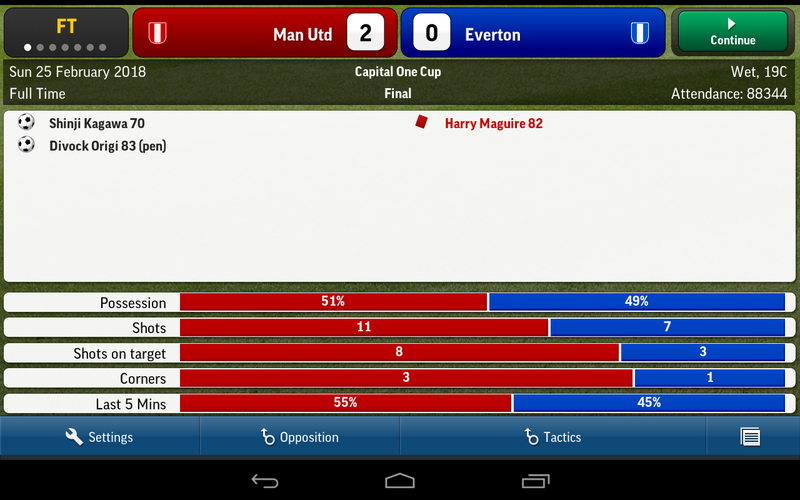 I've been playing around with loads of tactics in a test save. My current tactic still has an AMC, but I've been trying alternatives, too. How dare they win my cup! 18 goals and only five for Origi. Shabby. 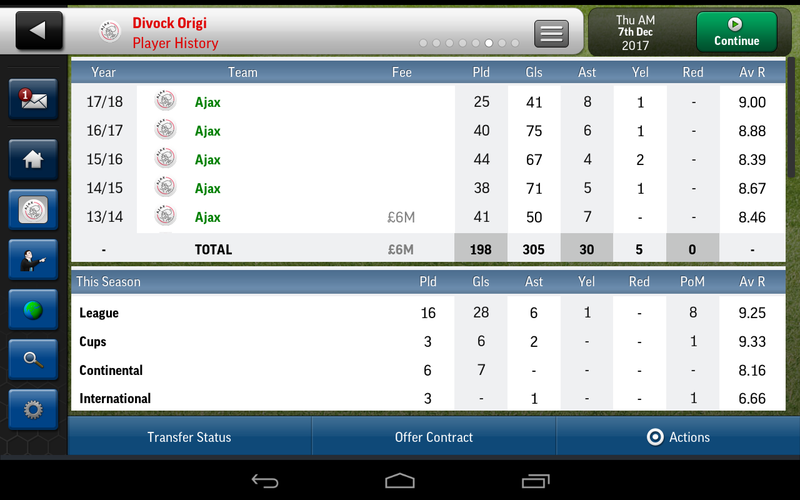 I left Ajax in a commanding position at the top of the league. One goal in three games since I left Ajax. He ,must have been pining for me. United had fared badly since Sir Alex left. Moyes hadn't lasted long and his replacement, Jurgen Klopp, hadn't been much better. When I joined them they were ninth in the table and even the most die hard fans had to admit that there was no hope of wining the league. They were however, still in the Champions' Cup, the FA Cup and the Capitol One Cup, so there was plenty to play for. The Belgian Boy Wonder brings home the bacon. Origi was inelegible, but I finally claimed the ultimate proze in European football without him. All things considered I'm happy with that. A predictably mediocre season from Origi scoring wise. 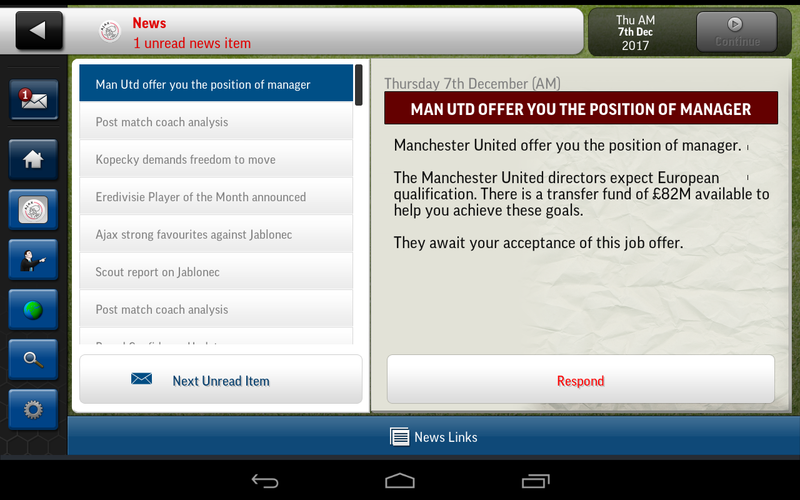 A lot of you may think I'm mad to move to the EPL and you may well be right, but I was keen to move around in this career and I still have the option of moving upwards to Spain if one of the big two ditch their manager. Origi is unlikely to score anything like as much in the Premier League, but he's still young and the much larger number of games may help to compensate for a lower goal to game ratio. *I've subtracted the one goal scored between me leaving Ajax and Origi comeing to United. 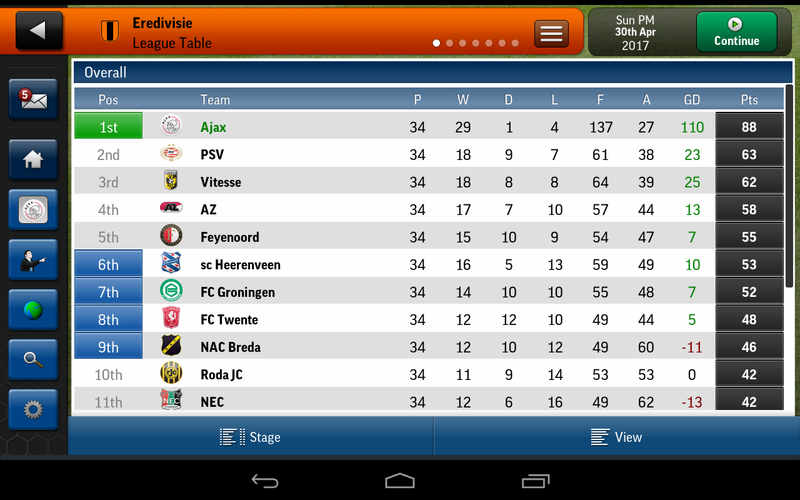 Looks like the Voorhoof target for club goals will be surpassed next season, but still a long way to go on the other targets. I'm staring to regret the World Cup goal target. It would be terribly easy to fail that one. So, an eventful season. Your comments (and abuse ) are always welcome.